With matters ‘Materia’ to attend to, Cosmic Gate’s ‘Wake Your Mind Sessions’ series went on hiatus last year. Absence, as they say, only makes the heart grow fonder and today the news those left bereft in ‘17 wanted, nay needed to hear… ‘WYMS’s back, baby!! Reinstated to its traditional release March slot, it’s ready to springboard you headfirst into Spring! So what’s what with ‘003’ then? Well - dare we say – it’s bolder in vision and even wider in its style & power-band. Bigger too, by virtue of an even higher ratio of exclusives, premieres and first-listen tracks - all threaded into the mix. Leaving no studio door un-knocked or creative avenue unexplored, Nic & Bossi have – as ever - been tireless in sourcing its sonic ordnance. That’s resulted in music, mixes and mash-ups as far as eye can see & ear can hear! Included among them, ripe from the studio desks of Estiva, Eskai and Leo Reyes, are new reworks of some of ‘Materia’s most majestic moments. You’ll also find freshly inked Wake Your Mind Records signings courtesy of Greenhaven DJs, Noise Zoo, Patrick White and Marcus Santoro. Mash-ups abound too, with Cosmic Gate getting their hands-on artists as diverse as Third Party and Marco V. And naturally they all fall between the hottest, latest soundware from a super-starry tracklist cast - Above & Beyond, Gabriel & Dresden, Kyau & Albert & Genix, Wellenrausch & Gai Barone and Tim Mason to mention but a few. STOP PRESS: New Cosmic Gate single With JES ‘If Not Now’ Out Now! Pre-order ‘WYMS003’ here: https://wym.choons.at/wyms003 and receive ‘If Not Now’ as an instant-grat track today!! 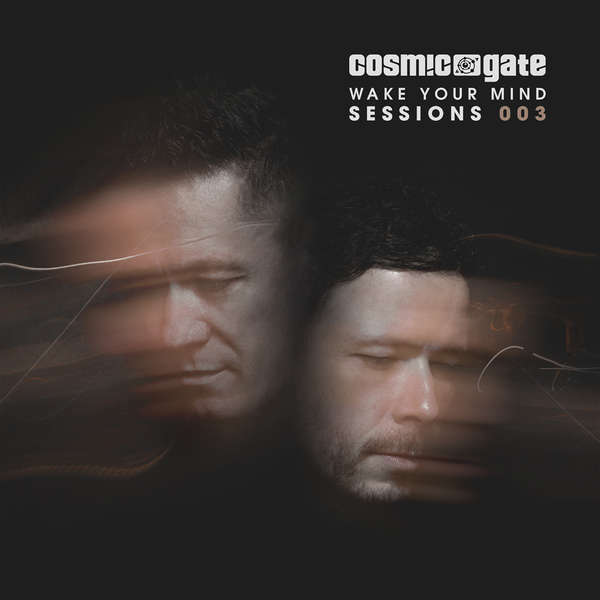 On completing Wake You Mind Sessions 003, Cosmic Gate’s Bossi commented: "as ever, a great deal of thought went into the structuring of these mixes. The first person we played it to really put their finger on it: ‘CD1, I turn on at work and CD2 I listen to in the car before I go out’ Music to our ears - that was exactly what we were going for! As laser meets disc, the atmosphere-soaked pads of Eskai’s intro-tweaked ‘Fall Into You’ mix get us underway. Early tone dialled-in, mix.01 plots a cool path through the progressive sound-fields. Staking their righteous claims there are Above & Beyond & Richard Bedford, with the Spencer Brown reworking of ‘Northern Soul’ and Jerome Isma-Ae & Alastor’s instrumental take on Wellenrausch/Gai Barone collab ‘Heroes of Light’. ‘WYMS003’ cross from prog into trance. Courtesy of Greenhaven DJs ‘The Unexamined’ and Tim Mason’s jacked-up ‘Switcher’, techier and more distortion-heavy vibes seize its centre-ground. Bringing Mix 1 to its mercurial apex are Maor Levi’s deliciously warped ‘Juno’ and Cosmic Gate just-released rephrase of Gabriel & Dresden’s ‘Only Road’. Through Estiva’s ethereal rework of CG x Super8 & Tab outing ‘Noom’ and ‘Find The Sun’ by Raz Nitzan & Moya Brennan, Mix 2 opens in cooler waters. This being Cosmic Gate though, you know it’s but a momentary calm before the storm. Ahead of the album’s mixing, the Wake Your Mind Records contract pen’s seen action aplenty and Nic & Bossi use the second disc’s midpoint to break out their latest signings. Elaborating, Bossi says: "we were blessed with a mass of exclusive track submissions from young & upcoming producers. In the end there proved to be too much great work to choose from! (We wanna send an especially big shout out to all the producers from around the world who sent us tracks!!). In the end we signed material from Australia’s Markus Santoro, Patrick White from Poland, Holland’s Noise Zoo and Greenhaven DJs from the USA. All exclusive on this album and later to be released on our label WYM Records. Keep a close ear out for them. Nic & I reckon you’re going to be hearing a lot more from these guys in the future!!" As it hits the home straight, CG reopen ‘Materia’s track-trove, lining up Ferry Corsten collab ‘Dynamic’, current single ‘If Not Now’ and – exclusively - Leo Reyes’ blistering remix of CG & Markus Schulz’s ‘AR’. To gift the mix a fitting finale, Nic & Bossi have included two new, thoroughly locomotive mash-ups for it. ‘Like This Body Of Conflict’ twists their (what else but!) classic ‘Body Of Conflict’ around last year’s pulse racing hit from Third Party. ‘WYMS003’s valedictory track (and a celebration of all things ‘V’) ‘Muraco's Godd’ sees Marco V’s most recent and most revered tracks united as one, for the techiest, most fearsome of tie-offs.